Sunday, 22 June — Myrna arrives via taxi from Heathrow before midnight. 23 June — No sign of jet lag. After crossing and recrossing Millennial Bridge, we go to Matisse cut-out exhibition at Tate Modern. Quick lunch at Albion. Walk along South Bank to the London Eye, where I chat with Donna (her daughter's charming South African sister-in-law) while Myrna enjoys the aerial view. The two of them head off for Selfridges (Myrna has been watching "Mr Selfridge") and a 9 pm dinner at Ottolenghi in Islington. 24 June — Morning at British library. Lunch outdoors at Eat. Link up with Donna to see "Julius Caesar" at the Globe. Simple dinner at home for the four of us, foraged from Tas and Borough Market; only raspberry sorbet and pecan lace cookies homemade. 25 June — Myrna and Donna visit Natural History Museum. In the evening Myrna and I off to "Forbidden Broadway" at the Menier Chocolate Factory. 26 June — Kew. Myrna's vegetable stir-fry for dinner. 28 June — National Museum of Scotland. Greyfriars kirkyard. Return to Royal Mile to leave first of Charles's rocks at Dunbar Close, a lovely little garden found by accident previous day. Lunch in outdoor courtyard of new age café. Museum of Childhood. See Holyrood from outside only, annual closure for royal access. Samosas++ from grocery near flat for dinner. Sunday, 29 June — Brunch at Loudons Bakery and Café. Take bus tour from New Town to Queensferry, catching boat through Firth of Forth to Inchcolm Island; wonderful ruined abbey, sea glass beach with pulverized-shell sand. Myrna picks winning tombola ticket for bottle of wine at small Lifeboat festival (with pipers) when we disembark in Queensferry. Myrna to botanic gardens ("better than Kew") while I dawdle in Edinburgh neighborhoods we haven't seen. Meet back at flat for quick leftover dinner before leaving to see "Chef" at cinema near flat. 30 June — Michael flies in, gets rental car at airport, drives to flat to pick us up and then on to our Glasgow Airbnb rental. Lunch at the Willow Tea Rooms provides first glimpse of the work of Charles Rennie Macintosh before sad sight of fire-damaged School of Art.Wander around city admiring massive Victorian buildings. Track down site of 18th-century tobacco exchange. Myrna discovers Pringle of Scotland for tartan gifts, Michael astounding selection of whisky at The Good Spirits Co. Bottle he enjoyed every last drop of: Kilkerran, Glengyle Distillery, Campbelltown, aged in sherry wood. Dinner sourced at M&S on Sauchiehall Street. 1 July — 25 degrees C!! Take tube to university area, where Michael first needs to have a scratched eye tended to while I introduce Myrna to Waitrose (revisited for dinner pizzas) and we again fail to find a bakery with oatcakes like those made on Cape Breton Island. The Hunterian Art Gallery (surprise collection of Whistler paintings, memorabilia) and wonderful Mackintosh House, then "A Play, A Pie and A Pint" at Oran Mor (a short adaptation of "Hamlet" with a terrific Ophelia, Adura Onashile). Back to Hunterian to tour the archaeological and scientific exhibits at the museum — first admiring a number of very fine kilts since it happened to be graduation day at the university. Lunchtime play, discovered by Myrna online, was far better than the touring National Theatre production of "One Man, Two Guvnors" in the evening. How could it possibly have won awards? Even Michael didn't think it was particularly funny, so this wasn't just an American sense of humor failure. The King's was a fine old theatre, though. Before dinner and play, Myrna visits the Museum of Piping while we return to Mackintosh House, try some of Glasgow's famous Italian ice cream at a shop set up by mid-20th-century immigrants, revisit Waitrose for dinner pizza. Meet up outside at pub next to piping museum, where Michael chats to another delightful Scot, this one planning to vote "no" in the referendum, unlike the charming young man in the whisky shop, who will be casting a "yes" ballot. 2 July — To Smiddy House in Spean Bridge via Luss (picturesque village of cottage gardens on Loch Lomond), Dunstaffnage Castle, good pub lunch at The Lorne in Oban, our first torrential rain (so no panoramic views of Glencoe), and a second memorable visit to the West Highland Museum in Fort William. A fascinating wing on WWII commandos had been added since Michael and I were there when Iain and Kate were small. The "secret" anamorphic portrait of Bonnie Prince Charlie is still on display, though the reproduction we bought three decades ago is no longer available, much to the staff's dismay. Smiddy's and its restaurant, Russell's, were both excellent. Mustn't forget to provide comment on booking.com. Our only bed-and-breakfast night with no cooking facilities. 3 July — First stop is the Commando Memorial outside Spean Bridge. Next is geological, the "Parallel Roads" of Glen Roy, visited by both Darwin and Agassiz. Pull-off at scenic stream, waterfall, overlook. Myrna's first glimpse of shaggy Highland cattle in field. Highland Folk Museum in Newtonmore: school, shop, train station, tailor's, homes, barn from various periods. Loch Duntelchaig (suggested by "yes" voter in Glasgow whisky shop — don't get to his other recommendations, Loch Ruthven and Dores Inn), Loch Ness. When we get to Inverness, Myrna and I beetle off to M&S for dinner ingredients. I forget to buy orange juice; Michael is not impressed. 4 July — No barbecue or fireworks, just misty rain. Morning cruise in Moray Firth: Myrna is able to add dolphins to the seals we spotted in the Firth of Forth. Drive to Cromarty on the Black Isle to see restored birthplace of Hugh Miller. Wonderful thatch made from reeds, open at end; spectacular garden sculpture by Helen Denerley. In an antique store with many temptations Michael buys The Old Red Sandstone and Testament of the Rocks, not first editions but satisfyingly old copies with leather and marbled paper covers. Pub lunch. Tour old parish church, a finalist in the 2006 "Restoration Village" competition that was awarded a 2007 Heritage Fund grant. Sand collection from Cromarty beach. Atmospheric Kirkmichael cemetery with ruined church on north side of Black Isle. When we get back to Inverness, Myrna checks out castle looking over town. Later Michael and I opt for dinner out at a traditional Scottish restaurant, which turns out to be fully booked. Instead have a delightful meal at Riva, an Italian restaurant far better than we were expecting. Dessert was particularly good: iced white chocolate marquis with balsamic strawberries and a delicate tuile made with egg whites and powdered sugar. 5 July — Culloden Visitor Centre, state-of-art tribute to brutal battle. Serendipity again: groups of girls in tartan performing Highland Fling. Ruins of Elgin Cathedral. Banff Bay "gold" sands, followed by lunch at Duff House (no time to enjoy a tour of this Georgian estate). "Pink" sands next at Cruden Bay. Arrive in the granite city of Aberdeen just in time to get the makings for dinner from Sainsburys and the Co-op since Myrna and I miss the M&S right off the high street until we're returning. For the best, though. 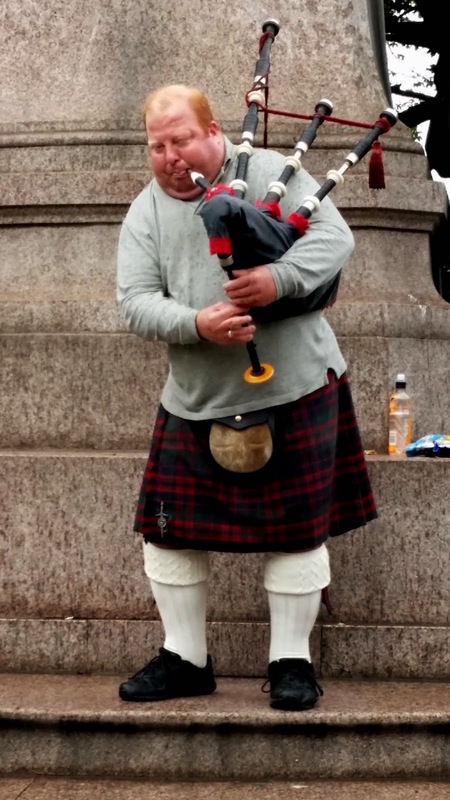 On our way back we pass a memorable stout, red-haired piper, who plays "Flower of Scotland" as we hang around after depositing our pound coins. Check out Prince of Wales pub after dinner but no live music that Saturday evening. Sunday, 6 July — To Union Street Gardens (smaller version of Edinburgh's Princes Street Gardens, west of Waverley Station and the Walter Scott monument), a lovely stretch of green threatened with redevelopment. Fine statue of William Wallace above. We had seen many statues during our trip — Scott, Adam Smith, James Watt, John Knox, Robert the Bruce, the obligatory Victoria and Albert — but this was the first of "Braveheart." Myrna and I walk down and up to Dunnottar Castle, but the steps are too much for Michael's knees. He has to rely on my photos, including those of quite an amazing puddingstone outcrops. Take a peek at the gardens of Crathes Castle before boarding the Deeside steam railway. High point was watching the engineer cook bacon and eggs on a coal shovel thrust into the furnace. Hurried lunch afterwards in mediocre old-school hotel pub in Banchory, but cheered up by dramatic moors as we continue on our way. Drive through beautiful city of St Andrews on to Donald Trump's ostentatious and controversial golf resort. After a few abortive attempts to get down to the beach, manage this at Kingsbarn, where Myrna places her last rock right before a rainbow appears on the horizon. On to another Airbnb flat in Edinburgh and a good dinner overlooking the Leith at The King's Wark, a pub dating from the 15th century. 7 July — Myrna has her last morning run in Scotland, this time along the Leith. Michael takes off for Siccar Point while Myrna and I take advantage of Waverley Station's left luggage service for a last walk down the Royal Mile before taking the train back to London. We return to Fudge Kitchen, visit the Gladstone Tenement (Thomas Gladstone, not William, and a prosperous merchant's house, not the sort of tenement that one conjures up from NYC experience). A cup of tea and terrific shortbread at Forsyth's Tea Room, managed by lovely woman with a cloud of violet hair and the most melodious of Scottish accents. The train deposits us home an hour or so before Michael arrives by plane. Takeout Indian meal, reliably delicious, from the Mango Tree. 8 July — Having gone for several early morning Scottish runs, Myrna gets to put on her sneakers and pound the path along the Thames for the first time. We then spend the day at the British Museum, before Myrna joins Donna for a farewell meal at the Young Vic with teacher friends. 9 July — Back to Ohio.